The Colombo Municipality together with the Army and environmental police will police the city after dark in a bid to arrest errant individuals dumping garbage within the Colombo city limits. The programme which was launched last night was a knee-jerk reaction to individuals dumping large bags of garbage inside the city during the night. 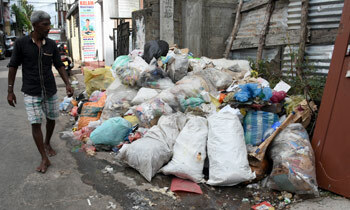 Colombo Municipality Commissioner V. K. A Anura speaking to the Daily Mirror said the garbage was not segregated and often brought into the city from the suburbs. “These piles of garbage are not segregated and since local government authorities no longer collect garbage that are not segregated, those who don’t segregate their waste dump it in Colombo at night,” he said. The recent occurrence saw large piles of garbage across the city with the CMC forced to clean up at least 200 metric tonnes a day. “We collected at least 750 tonnes of garbage from roadsides this week. We are certain the garbage is not produced from residential areas in Colombo as most of the waste we collected had come from large production facilities such as farms,” Mr. Anura added. We as a citizens of this country has a responsibility too. For most of us, it's simple investment of a compost bin to collect all degradable refuse which in turn will be made to compost. Let us do our part to the environment we live in. Don't depend entirely on the government. So where do you expect TAX payers to dump the there garbage.....Lets ask them not to eat so we dont have any garbage - recycle. The word Yahapalnaya is like garbage. We thank the Dehiwela/Mt.L Municipal Council collectinggarbage in prompt way,however please take a note somepassers by dump always huge garbage in the early morning hours,near theAttapathu Lane(Off Galwela road),and place looks very eyesore in the morning hours and smelling,better catch them and punish culprit. It is a fact that rubbish are not COLLECTED by Abans. This is another gimmick to created to mess up the day to day life of the people. I am a retired person and watching daily but collectors doesn't sight. Don't blame the people but make your priority positive.This is a fact to create Gothapaya important to this land belongs to Rajapakses. Please facilitate to collect and clear garbage then people will not dump. before putting rules provide proper facility to citizens. sri lanka got the habit of putting rules without building the infrastructure. Good luck to the CMC with this harebrained idea. The municipal councils never had a proper garbage disposal plan from the beginning. All they have to do is to see that the garbage is collected on the designated days. No excuses. People will stop dumping garbage on the roads. These are all temporary solutions. After one week it will be back to normal with garbage all over the place. Tell me one thing which has kept its word. The garbage issue has not been revolved up to date! our garbage had not been collected for the past one week! Whats happening? Has the government no solution for the garbage issue? People won't be dumping garbage elsewhere if the garbage collection process worked efficiently. We have the same issue in our neighborhood....the trash collectors expect us to compost. I'd like to know how when we don't have garden space to do so. On top of all that, the trash collectors demand payment on a weekly basis to collect the garbage....if not, they won't take the garbage. If I need to pay them, why am I paying taxes? Govt , Officials please go home . Give it to some one who can govern . Dump all garbage in front of CMC Ministers House. This is the best idea. What do they expect people to do if the garbage is not collected regularly. This govt has lost it completely. Regret, regret, regret for voting for these idiots. The situation was never so bad. Ha haaa. Be patient, more and more to come! THIS PROBLEM STARTED HAPPENING AFTER COLLAPSING OF CLONNAAVA GARBAGE DUMP, HOW WAS THIS CONTROLLED BEFORE THAT. First of all, place large bins in different colours (Red,Blue,Green etc) for segregated waste, as in other countries. How do people know how or where to put different waste?